Real estate agents push out home sales from the closing table to your mobile device. A real-time home-sales feed of every residential property sale on the MLS - as it happens - powering real estate agents with brand-building credibility and buyers & sellers with powerful decision-making data. Receive the credit you deserve for your home sales. Syndicate to all your social channels with one click. Build your personal, team & broker brands while generating new leads. Use Real-Time comps to determine the right offer price. Find the buyer’s agent that will find your next home at the best price. Follow the sales feed to see what other buyers are paying. 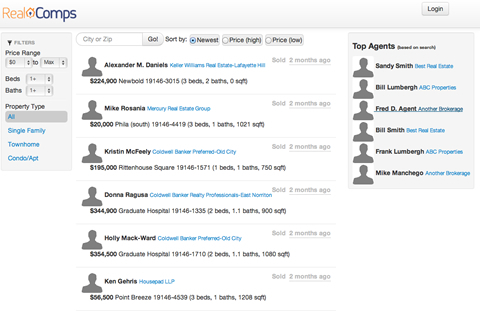 Use Real-Time comps to determine the right listing price. Find the listing agent that will get you top value for your home in less time. Follow the sales feed to identify market sales trends.